Town in the district of Dolina, Galicia, Austria, the population of which in 1890 was 4,402, of whom half were Jews. The Jewish community dates from the day of the foundation of the place in 1612 by Nicholas Giedzinsky. According to the privileges granted the Jews by the founder and confirmed by King Sigismund III. of Poland, they enjoyed equal freedom and rights with the Christians. They were released from all burden-some taxes and from the compulsory supply of relays. They had the right to build in any part of the town, and were granted a plot of ground for a garden to each house. Both were their exclusive property, subject only to the payment of a small tax to the lord of the manor. A place to build a synagogue and land for a cemetery were granted them gratis and were free from taxes forever, as were also the other communal buildings that might be erected on the grounds of the synagogue. Charges by Christians against the Jews were under jurisdiction of the lord of the manor or of the judge appointed by him, in accordance with the existing statutes and the privileges granted the Jews by the king. The Giedzinskys were always favorably disposed toward the Jews, who had the right to be elected as jurymen and even as mayors. When, in 1660, the first city mayor was sworn in, he made oath as follows: "I solemnly swear to live in harmony and to defend the rights of the Roman Catholics, the Greek Catholics, and the Jews; of the rich and of the poor alike." 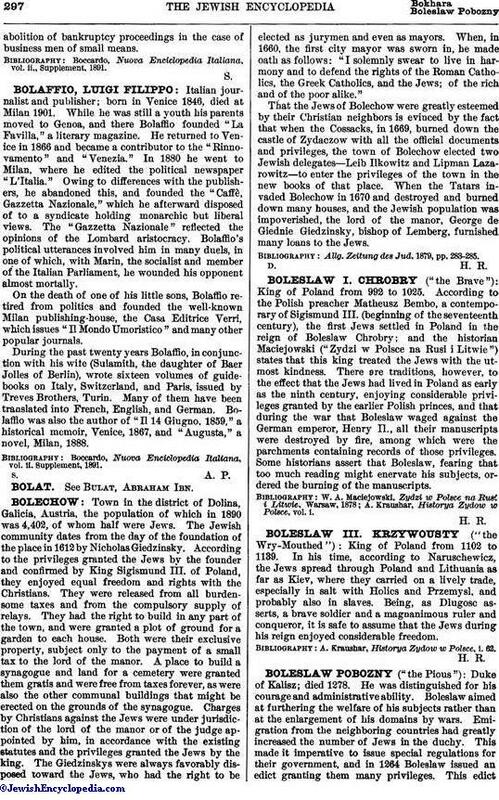 That the Jews of Bolechow were greatly esteemed by their Christian neighbors is evinced by the fact that when the Cossacks, in 1669, burned down the castle of Zydaczow with all the official documents and privileges the town of Bolechow elected two Jewish delegates—Leib Ilkowitz and Lipman Lazarowitz—to enter the privileges of the town in the new books of that place. When the Tatars invaded Bolechow in 1670 and destroyed and burned down many houses, and the Jewish population was impoverished, the lord of the manor, George de Giednie Giedzinsky, bishop of Lemberg, furnished many loans to the Jews. Allg. Zeitung des Jud.1879, pp. 283-285.